Venezuelan President Hugo Chavez celebrates with a crowd of supporters after winning reelection. Photo by Juan Barreto / Getty Images. Modern liberals see something ominous in the Chavez mandate. They frequently opine that the dark-skinned poor are an uneducated, worshipful, populist mass of people subject to the Leader’s hypnotic speeches. Hugo Chavez was reelected president of Venezuela by a 56-44 percent margin on October 7, extending his 14-year revolutionary tenure for another six-year term. The margin was significantly closer than in previous campaigns, and set the stage for legislative elections this December. Chavez was carried to victory by the dark-skinned voters who form the core of his revolutionary experiment, and against the continuing skepticism of mainstream liberal media like The New York Times and leaders of both U.S. political parties. At the beginning of his term, President Obama offered a friendly handshake to Chavez at a summit of the Americas, but hard-line administration officials, whom Obama both inherited and kept on their jobs, smothered that initial thaw. In the established consensus view, Latin America was divided by a “good” left -- for example, Brazil and Chile -- and a “bad” left led by Chavez along with Cuba, Bolivia, Ecuador, Argentina, Nicaragua, occasionally Peru, and Honduras before the coup. The dividing line seemed not to be whether the countries in question held democratic elections, but whether they adjusted to the agenda of international financial institutions (IFIs). The division was awkwardly constructed on the model of the Cold War. The official Obama Venezuela policy, articulated by his former security adviser, Daniel Restrepo, has been to de-escalate the tension and threats of open destabilization, while at the same time doing little to nothing publicly to improve the bilateral relationship. Mitt Romney condemned Obama on Monday as being too soft on Venezuela. Chavez’ opponent, Henrique Capriles Radonski, a 40-year-old former legislator and scion of a wealthy developer, managed to unite a fragmented Venezuelan opposition. The United States was invisibly neutral in the process. Chavez is being treated for cancer in Cuba, not only because of the medical skills of Cuban doctors, but because the Cuban government has held tightly to any news of his condition, which would have been the subject of daily tabloid gossip if Chavez was being treated in Caracas. Nevertheless, Chavez has been away for prolonged periods, indicating to many Venezuelans that his time in power might be short-lived and the future uncertain. Continuing problems of crime, violence, and institutional dysfunction formed the basis of Capriles’ challenge. But Chavez’s indisputable claims to have sharply reduced poverty and improved health care for the poor sustained his march to victory. 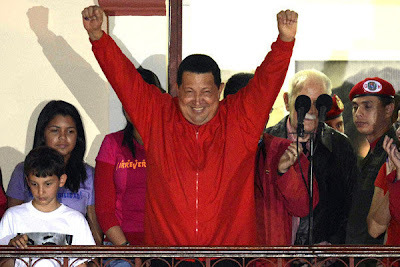 The core, though not all, of Chavez’ support came from the long-disenfranchised, dark-skinned sector of Venezuelans. According to most accounts, one-fifth of the population is white, while the rest are mestizo (mixed), African and indigenous, historically the most oppressed sectors of Venezuelan society. Electoral turnout was 80 percent for the election, consistent with a pattern of high mobilization during Chavez’ tenure in office. Venezuela under Chavez has been the site of more presidential, legislative, and local elections and referenda than any country on earth. Reputable observers like former President Jimmy Carter have recognized its electoral process to be fair. But The New York Times, the U.S. State Department, and some on the liberal-left spectrum remain hostile to the Venezuelan government no matter how many elections it wins. Their skepticism ranges from legitimate issues such as Chavez’ caudillo style of governing to a belief that Chavez is building a dictatorship through democratic elections. Corporate-oriented diplomats like Davidow may fear that Venezuelan democratic socialism is a creeping democratic threat to private American economic interests -- including oil -- in the future. Or they harbor an unconscious imperial bias going back to the Monroe Doctrine. But modern liberals like the Times editors and reporters also see something ominous in the Chavez mandate. They frequently opine that the dark-skinned poor are an uneducated, worshipful, populist mass of people subject to the Leader’s hypnotic speeches. They complain that the Chavez base is subsidized by grants for eye care, preventive health care, housing, schooling, and, above all, government jobs. Thus, their argument suggests, Chavez has an unfair structural advantage, a lock on the electorate, due to his misiones (government programs). On the surface, the argument would seem specious when 45 percent of the electorate votes, rallies, and protests loudly against Chavez year after year. They even voted against Chavez in 2007 when he sought to run for reelection indefinitely. Venezuela is a wildly argumentative society. But there is an establishment fear that resembles that of Mitt Romney in his off-the-record condemnation of the “shiftless” 47 percent who will vote for Obama because they are blindly dependent on federal spending. In this view, such people are an unqualified populist mass of voters, whether they live in Harlem or Caracas. Chavez runs “a well-oiled patronage system, a Tammany Hall-like operation,” according to the Times. What is ignored in this criticism is the historic discrimination and exclusion that made possible the rise of Tammany politics, and the fact that most people will excuse corruption if the corrupt machine delivers, which Chavez is so far able to do. These are the same assumptions that underlie the modern neoliberal opposition to public (that is, government) spending, public works projects, public education, and public radio and television programming. The implicit “solution” is not to make these programs more transparent and accountable, but to privatize every sector of life possible. And that the voters of Venezuela will not do. It is true that some Chavistas are so reflexively protective of the Bolivarian Revolution that they have difficulty criticizing the regime on any count. But any radical or revolutionary movement in power is bound to encounter intractable policy problems and harbor a tendency toward insulation and aggrandizement. It appears that the Chavez era is beginning to wane, if only because of time and mortality. How to manage a gradual transition is a major challenge the Bolivarian civil society, party activists and intellectuals all face. The regional power balance will be at stake. Tragically, the United States and its mainstream policy intellectuals are unlikely to be constructive good neighbors.